Exploring ocean beds, drifting through schools of fish, floating free in 360 degrees, she has experienced it all under water. Our EasyFold team, likes to stop and appreciate those individuals who find ways to excel where some may see limitations. Sue Austin required a wheelchair to help her mobility in 1996, after contracting a virus that attacked her central nervous system. She viewed the experience of using a wheelchair as both freeing and inspiring, which is perhaps not the usual answer you’d expect from a wheelchair user. When she spoke to others about their own experience of using a wheelchair, they tended to use words like “limitation,” “pity,” and “restriction.” Hearing these responses ignited a spark in Sue and she wanted to change the narrative about using a wheelchair. She began working with a team of experts to create a self-propelled wheelchair that would work underwater; Sue wanted to change the way people looked at disability. She discussed the idea of scuba diving without actually leaving the wheelchair with engineers and dive experts, and most were skeptical of the idea at first, as they thought wheelchairs are not designed to go through water and feared the chair would go into a spin after the dive. Austin persisted and it was her perseverance and passion for the project which convinced the experts to push their minds past their preconceived notions about wheelchairs. Eventually, the team found a way to make Sue’s dream into a reality, resulting in a spectacular invention. In 2012, Olympic and Paralympic games. 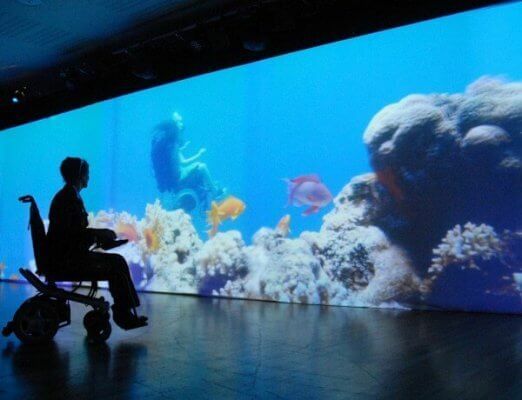 The work she created for the event, called “Creating the Spectacle” was a groundbreaking series of live art and video works of her underwater wheelchair. In re-purposing her wheelchair to create fantastical art, Sue Austin was able to reshape how many people look at disability. Her wheelchair, also known as “The Powerchair,” freed her from the shackles and helped her to not only increase her own independence but inspired others to do the same. We cannot thank Sue Austin enough for the hard work and dedication she has put towards creating a better understanding of the wheelchair community. A Wheelchair doesn’t symbolize disability anymore. This entry was posted in Inspirational and tagged buying wheelchair, EasyFold wheelchair, mobility wheelchair, portable power wheelchair, portable wheelchair, underwater wheelchair, wheelchair, wheelchair scuba diving. will you be having a sale again on the elite folding power wheelchair? Our EasyFolds are water-resistant, meaning they able to resist the penetration of water to some degree (e.g. light rain) but are not entirely waterproof and it is not advised to go scuba diving with them. They’ll probably look cool scuba diving but will most likely not function as a power wheelchair afterwards.